5 Top Stock Trades for Wednesday: AMD’s Teaming Up With Amazon? U.S. stocks were mixed with the midterm elections being held on Tuesday. Investors want to see which party will seize control of the House and Senate before making any significant buy/sell decisions. That doesn’t leave us short of top stock trades to choose from though. Advanced Micro Devices (NASDAQ:AMD) jumped more than 8% at one point Tuesday after it was announced that the company will supply chips to Amazon’s (NASDAQ:AMZN) data center, possibly impacting Intel (NASDAQ:INTC). The stock bounced off $16 support and held the 200-day relatively well despite a violent selloff. This is exactly what we’re looking for. In any regard, shares are now back above $20 and at a key level. Can they hold above this mark and get back above channel support (blue line)? If it can, the 21-day near $23 and channel resistance near $24 are in the cards. If it can’t, $18 and the 200-day are back on the table. A top and bottom-line beat propelled shares of CVS Health (NYSE:CVS) higher by 5% on Tuesday. If it can make it to $78-ish, CVS will fill the gap from last month. Will it act as resistance? That much is unclear. The stock has been trading pretty well since its lows last week, a perfect touch of the 200-day moving average. Should CVS consolidate for a few days, look to see that it stays over its 50-day moving average. Below and its 200-day is back on the table. 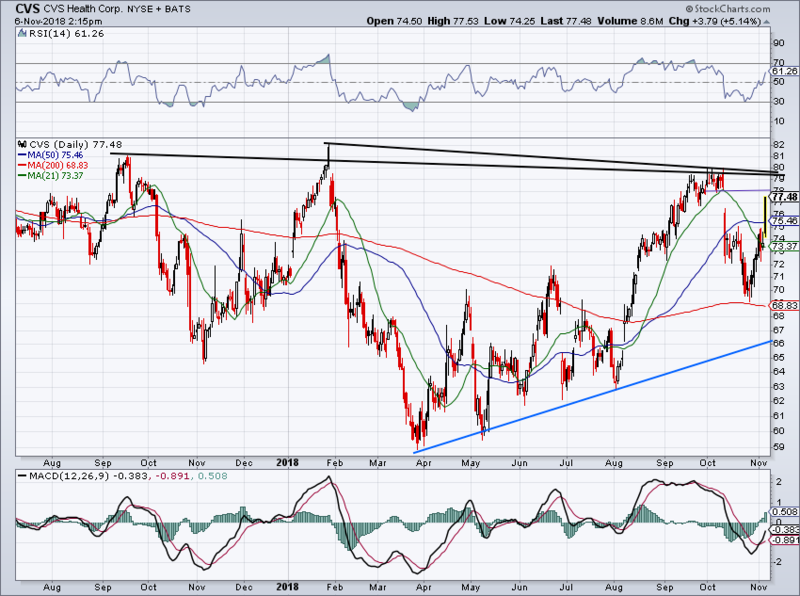 Should CVS clear $78, look for a retest of downtrend resistance (black line). Over it and a fresh breakout could occur. Continuing the better-than-expected earnings theme in the auto industry, Toyota Motor (NYSE:TM) gave a solid outlook, raising its full-year expectations. 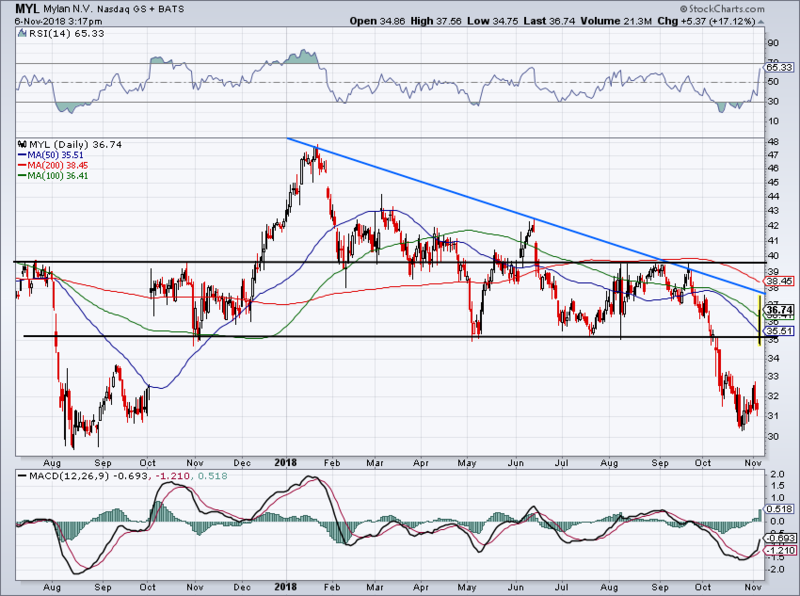 The $114 level held as support, but investors will want to be mindful of Toyota until it can close above the 50-day and downtrend resistance. I will keep this on my watchlist to see if it is able to. A break below $114 and more lows could follow. Shares of Mylan (NYSE:MYL) are surging more than 17% on Tuesday after the company beat on earnings and missed on revenue expectations. Unfortunately, if you missed today’s 17% gain, you might be out of luck for a while. Although MYL could push its way through downtrend resistance at $38, the 200-day moving average at $38.50 and resistance between $39.50 and $40, I have my doubts it will. While that represents about 10% of potential upside, there’s no telling which resistance point will kick MYL down. 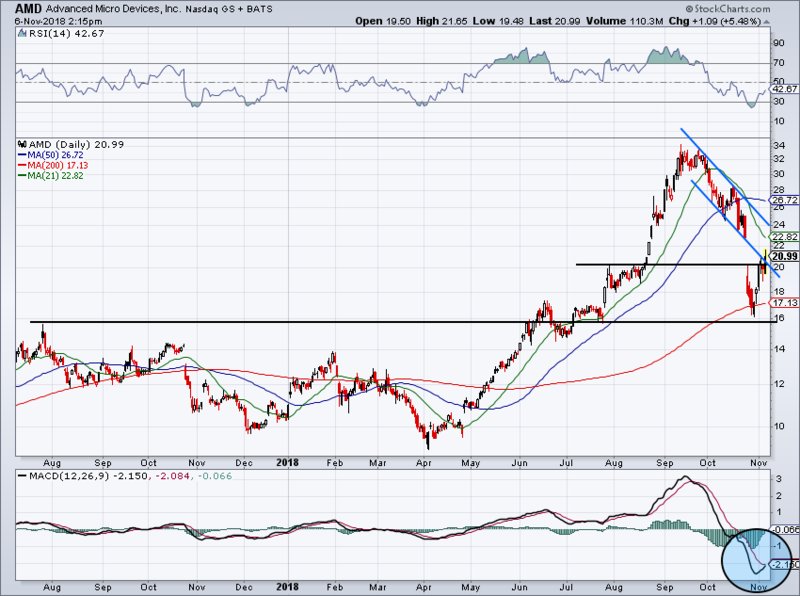 I’d rather give the stock a few days to see if it can consolidate above the 100-day moving average. If not, see if range support near $35 and the 50-day can hold and go long there for a better risk/reward. Midterms are overshadowing a number of big earnings reports, the last of which on the list includes Eli Lilly (NYSE:LLY). Despite beating on earnings and revenue expectations, shares are down 4%. The chart is simple. After such a big run, shares are set to make a decent move in one direction or the other. 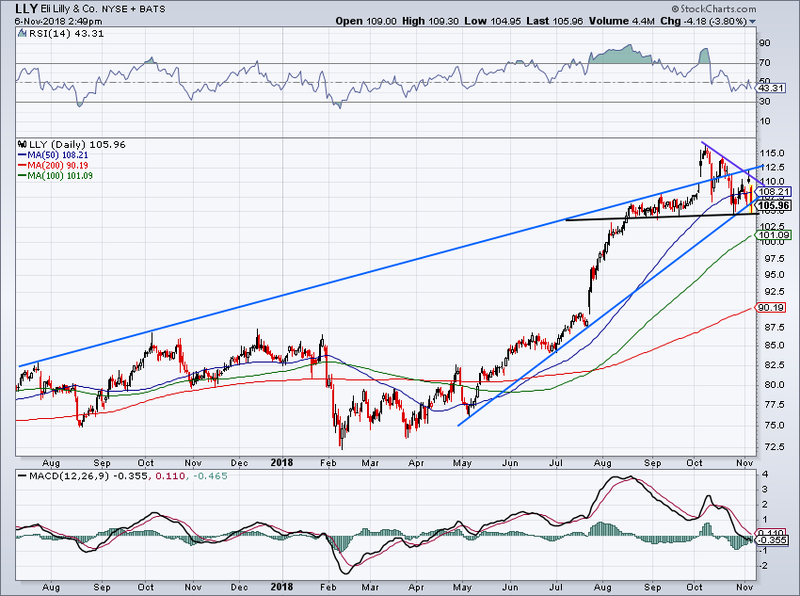 Above $108 and we should get a test of channel resistance near $112.50 (blue line). Above it and the $116 highs are on the table. Below $105 and the 100-day is the next line in the sand. Below it and the 200-day is in the cards. Bret Kenwell is the manager and author of Future Blue Chips and is on Twitter @BretKenwell. As of this writing, Bret Kenwell was long AMZN. The post 5 Top Stock Trades for Wednesday: AMD’s Teaming Up With Amazon? appeared first on InvestorPlace.